In this paper, the communication of destination brands through social media (Twitter and Facebook) is investigated with a focus on the use of emotional adjectives. Based on ten of the most popular destinations in Europe, more than 15,000 tweets and 6000 Facebook posts and users’ reactions to those messages were analysed. The study shows that DMOs are active and communicate using various emotional values about their brands on both platforms. The most popular emotional brand values for Twitter are ‘glamorous’ and ‘happiness’, while ‘honest’ and ‘trendy’ appear most frequently on Facebook. Interestingly, besides the fact that users actively engage on both platforms, significant differences were detected based on the values that users respond to as opposed to those that destinations use in their communication. Users respond much more strongly to messages that contain values related to the adjectives ‘sentimental’ and ‘happiness’ on Twitter, whereas on Facebook, adjectives such as ‘getaway’ and ‘young’ generate better responses. The study demonstrates that destinations can improve user reaction rates on social media and facilitate a positive destination brand image through the use of specific emotional brand values. Overall, the findings provide valuable as well as directly applicable implications for DMOs to use different values that align better with user expectations of the destination, which will ultimately lead to more effective online marketing strategies and stronger competitive profiles. This is an extended version of a conference paper entitled “Do DMOs communicate their emotional brand values? 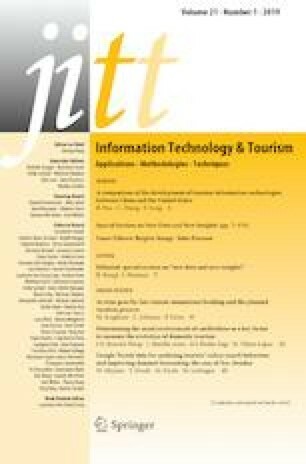 A comparison between Twitter and Facebook”, previously published in the proceedings of Information and Communication Technologies in Tourism 2018 Conference (ENTER 2018) held in Jönköping, Sweden, January 24–26, 2018.